The Sebastien Millon print I purchased. I’m an art buyer. That doesn’t mean I’m rich (far from it), or that I can commission large scale works from famous painters. No, when I say I’m an “art buyer,” it just means that I buy art. When I do, it’s usually something affordable by an underground or local artist. I enjoy all of Millon’s designs, but my favorites are those that feature a violent, havoc-wreaking rabbit. 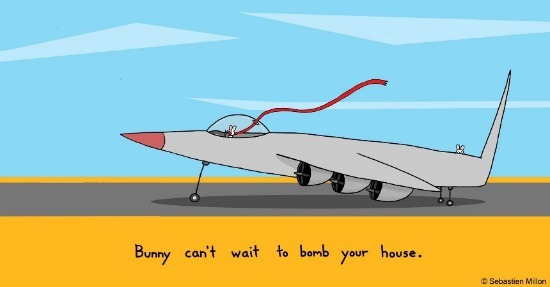 He’s got one of a rabbit in a bomber jet that reads “Bunny can’t wait to bomb your house.” I bought an 8 x 10 print of that one, because my girlfriend Bootstrap loves bunnies, planes, and mischief. And it cost a mere $15. Check out more of Sebastien Millon’s work at www.sebastienmillon.com.